The 28 pairs of eyes don’t have a starting point.Lucy Gellman Photos. The 28 pairs of eyes don’t have a starting point. Katherine Dunham leans back, the carriage of her arms nearly a perfect U above her head. Paul Robeson is looking at something off to his left that we can’t see, suspended outside the borders of the picture. Leyonte Price is regal, eyes turned upward, afro encircling her face. Her earrings glint even in black and white. Gordon Parks is too busy to look at us. He’s got his camera rolling in one hand, and has his eyes locked on whatever it is capturing. 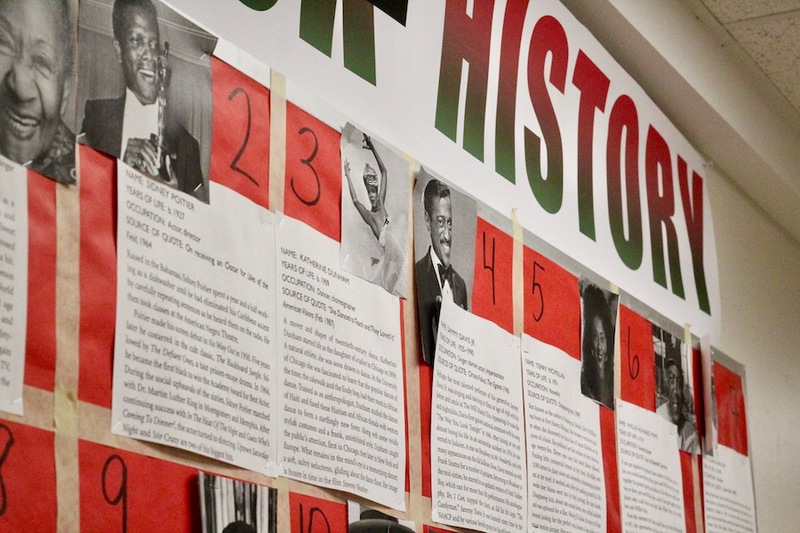 They’re part of a new, large display at High School in the Community (HSC) celebrating 28 Black Americans—14 men and 14 women—in the arts, humanities, sciences, and sports. Organized by 17-year-old Ny’Asia Davis, a senior who serves as president as student council, the display hangs in the cafeteria, where it will stay after February has ended. Ny’Asia Davis: Vote for me in 2044. The display wasn't originally part of HSC’s administrative plan or its annual curriculum. But when Davis watched Black History Month activities fall apart at the beginning of February, she decided to take matters into her own hands. In January, the student council had voted to have morning shout-outs to Black Americans—two a day, from a rotating cast of students who were interested in presenting. They’d also voted to hold a ‘town meeting’ for the second year in a row, discussing past and present Black history in a large group. But Davis was skeptical. It took Davis and Nhem hours to get the photos and biographical labels exactly where they wanted them. As a finishing touch, Davis placed a blocky black line through the word “Black.” Sharing a photo of the display to social media, she and HSC Curriculum Leader Cari Strand both added a hashtag to clarify its presence: #BlackHistoryIsAmericanHistory. It’s a fuller version of American history as she hopes it will one day be taught, Davis added. Not included are historical figures who she has seen get a lot of airtime—Martin Luther King Jr., Rosa Parks, Malcom X. She said she had to fight fellow student council members on that choice (“It wasn’t a debate, but it kind of got heated!”) but that it only strengthened her resolve to highlight figures that her classmates may not yet know. Now, she said she hopes to see the display stay up through June, when she graduates and heads to college. As of Tuesday, she had just been accepted to eight schools including Clark Atlanta University—her first choice—and was already thinking about how her background leading the student body might catapult her into a Political Science major. “You can vote for me in 2044,” she said smiling, before noting that she feels conflicted about mounting the display during Black History Month, but ultimately decided it was the best thing to do for the student body. From left to right: students Tyron Houston, Mike Pauta, and Jano Johnson. Downstairs, three fellow students sang in a chorus of agreement as they passed through the cafeteria. Davis perched on the edge of a table staring at her favorite figure, Sammy Davis, Jr. Above a big, crinkly bow tie, he looked back at her, beaming.